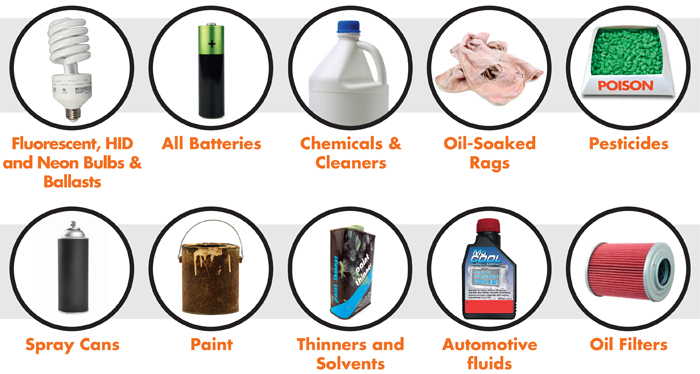 Hazardous waste is waste that is flammable, toxic, corrosive, or reactive. If you have hazardous wastes that need to be discarded, they cannot go in any recycling or refuse containers and are illegal to put in the landfill. The Department of Public Health may be one option to help manage your hazardous waste.. Contact the Department of Public Health. To contct the Department of Public Heath about hazardous waste disposal, call (415) 252-3962 or fill out the inquiry form. Gently used appliances and electronics. If you have items or supplies that are usable, like working electronics, including computer monitors or electrical appliances, contact the Virtual Warehouse, an online system for San Francisco City employees to submit and receive used appliances and electronics. Batteries. Get free household battery recycling bins from Staples. Questions? Contact 877-826-7755. When full, mail them for free so they can be recycled. Print hazardous waste disposal signs and post them at your department. If you can't print, order hazardous wastes disposal signs here. Buy less. The best way to reduce toxic waste is to buy less in the first place. Check the Virtual Warehouse before buying new items. If you need additional information about recycling and managing hazardous waste, contact the Zero Waste Coordinator at your department, or call the Department of the Environment at (415)355-3700.